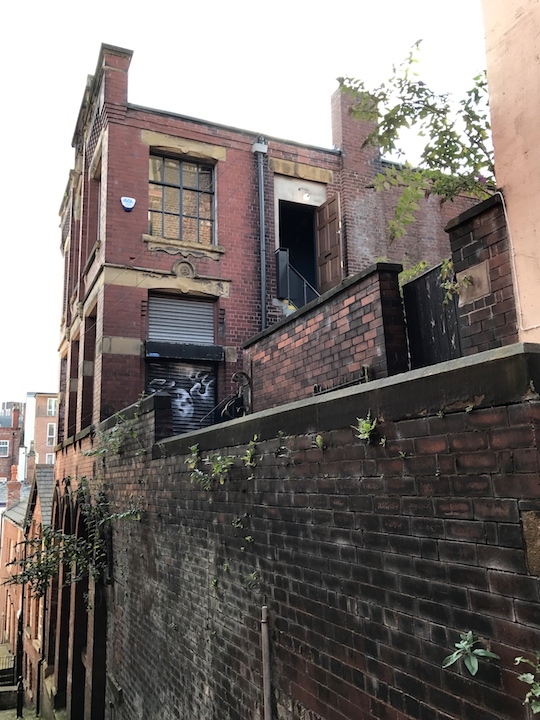 Where The Light Gets In ("WTLGI") is a new restaurant in Stockport, which opened its doors in October 2016. 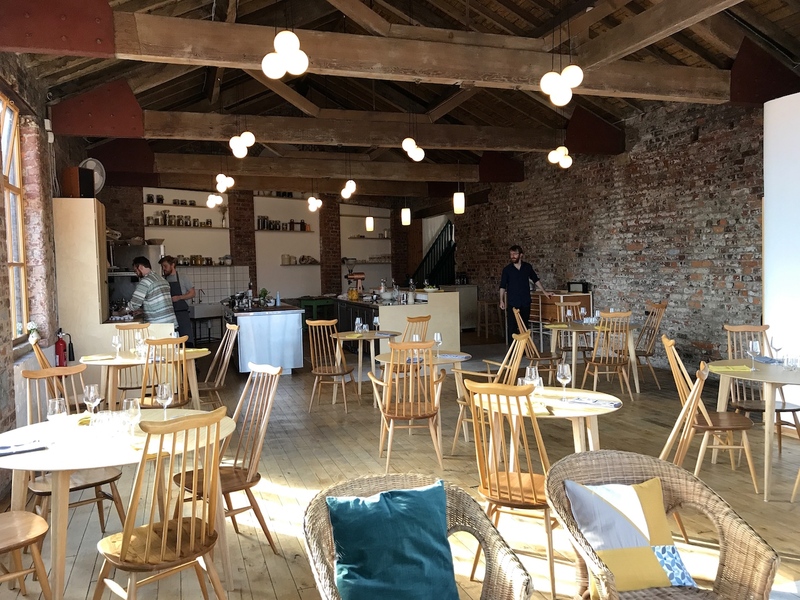 Chef/owner is 34-year-old Sam Buckley, who has previously worked in the kitchens of celebrated chefs such as Gary Rhodes, Paul Kitching (at the then 1-star Juniper in Altrincham) and Simon Rogan (at l'Enclume). The 25-seat restaurant is housed in a former coffee warehouse, close to Stockport's Victorian market hall building. There's no sign, so the restaurant is almost impossible to find (I got to know the surrounding area of WTLGI quite well), but once inside there's a welcoming room with an open plan kitchen, and beautiful light shining in through large windows. WTLGI is open for dinner Wednesday through Saturday and they offer a multi-course tasting menu for £75. The wine pairing is priced at £45. I had dinner with my husband at WTLGI in August 2017. Dinner started with an aperitif in a special seating area in the dining room. 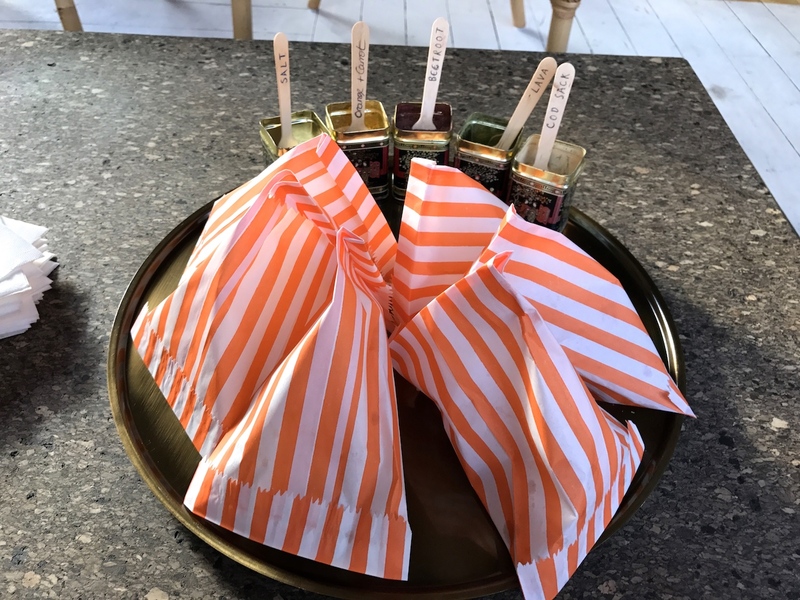 Waiting for us here were little bags of homemade potato crisps with a choice of seasonings, including salt, orange & carrot, beetroot, lava, and cod sack (I picked lava). A fun start of the evening. 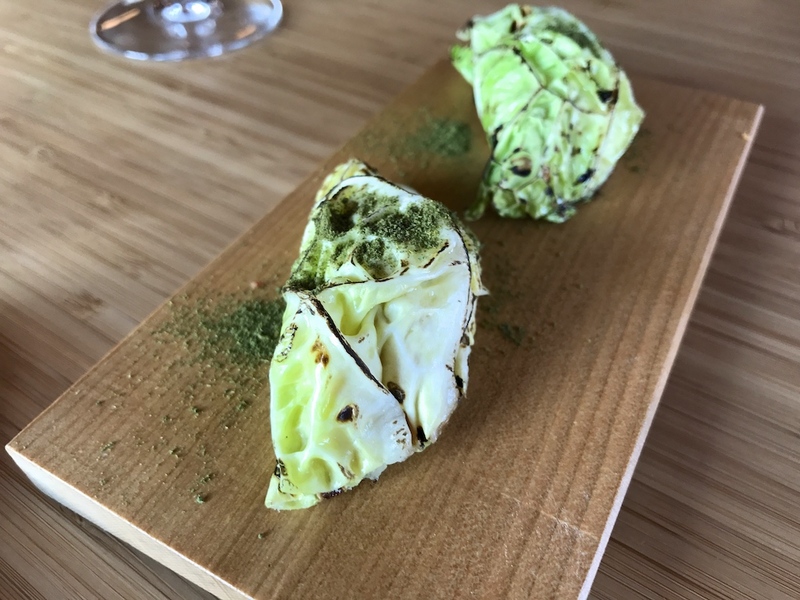 Once we were seated at the table the first course arrived, 2-day fermented and lightly charred cabbage leaves (fermented with honey and salt) with a tasty filling of fresh crab and apple and served with a kombu and laver powder. 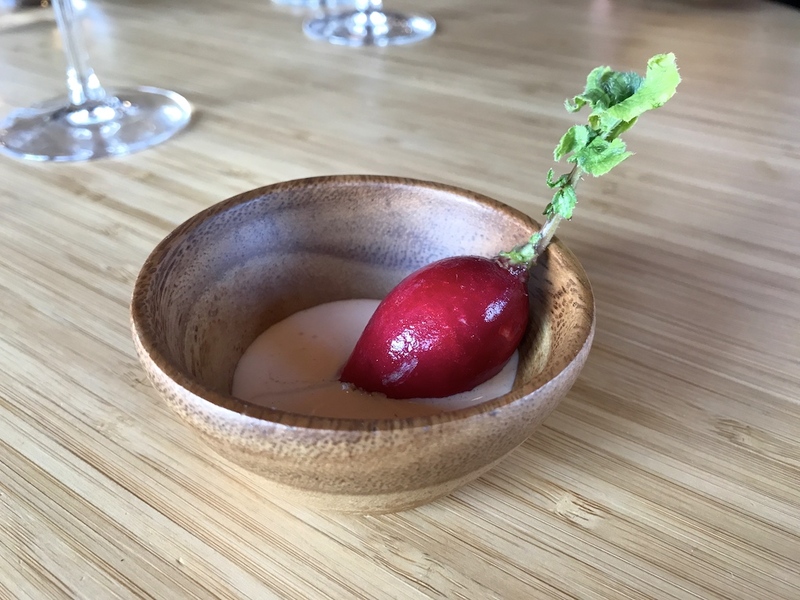 Shortly after, this was followed by a biodynamic radish, sprayed with quince vinegar and served with a pungent cod roe dip. Two tasty and prettily presented bites. 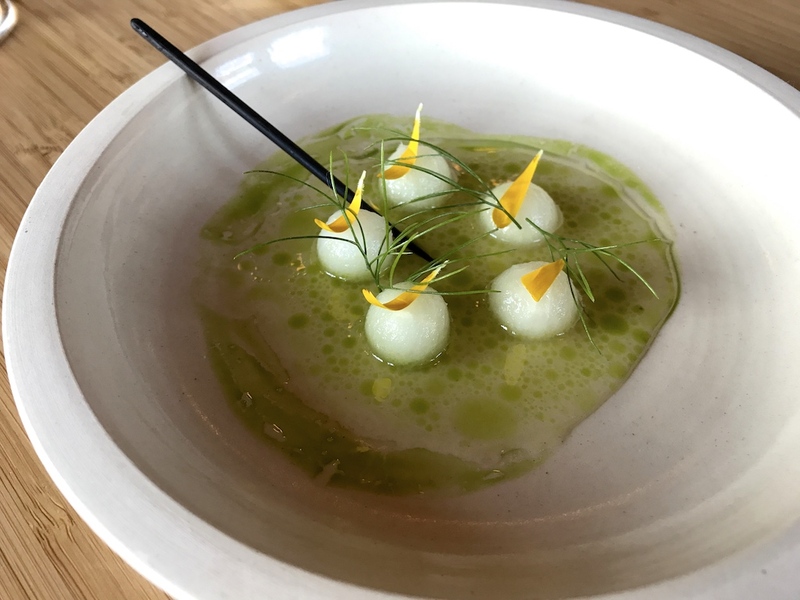 Next was a dish with salted kohlrabi balls, garnished with wild fennel and marigold and served with a whey broth flavoured with katsuboshi and apple juice. Interesting sweet and sour flavours and a hint of funkiness coming from the broth, but not necessarily a very convincing dish. As it turned out the chef agreed, because he told us that he was not sure of this dish either. 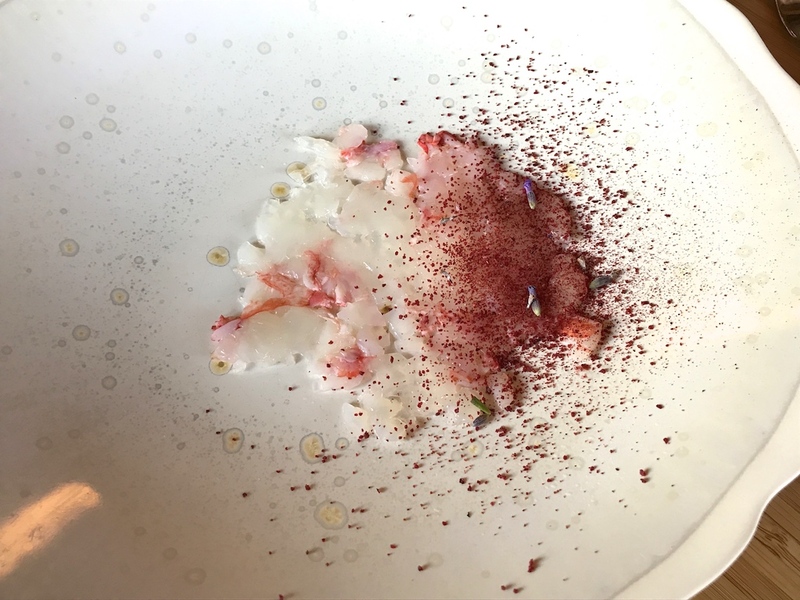 Fourth course was a raw langoustine carpaccio, served with a coarse plum powder, lavender buds, and a "spray" of rose distillate. Underneath the carpaccio was some sort of emulsion made with the langoustine brains and head juices. A lovely dish, the tart fruitiness of the plum powder complementing the langoustine nicely. Cornish mussels followed. 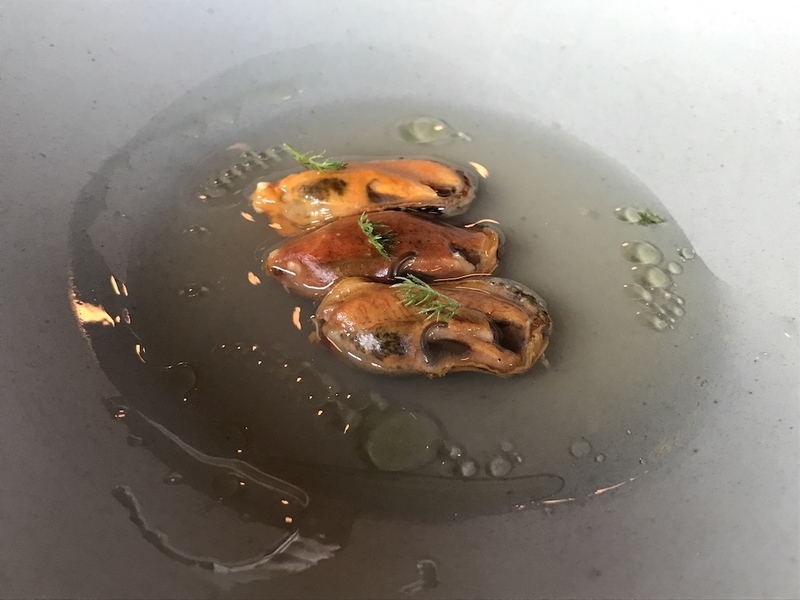 Three tender mussels served in their own cooking juices, seasoned with fermented peach oil and horseradish juice. The mussels were great on their own, but the seasoning was too subtle and did little for the mussels. 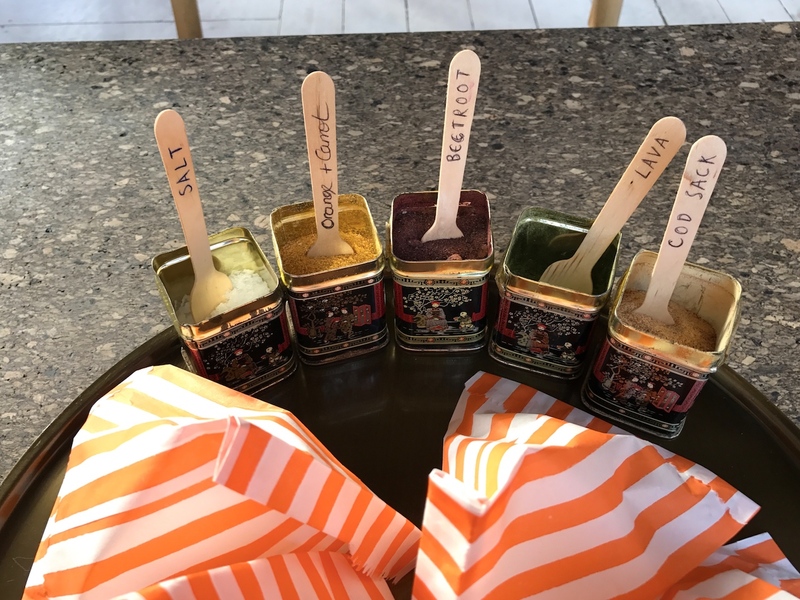 The horseradish only came through at the very very end, and the peach was, apart from a yeasty note, hard to distinguish. Fifth course was a dish called "Summer Porridge". 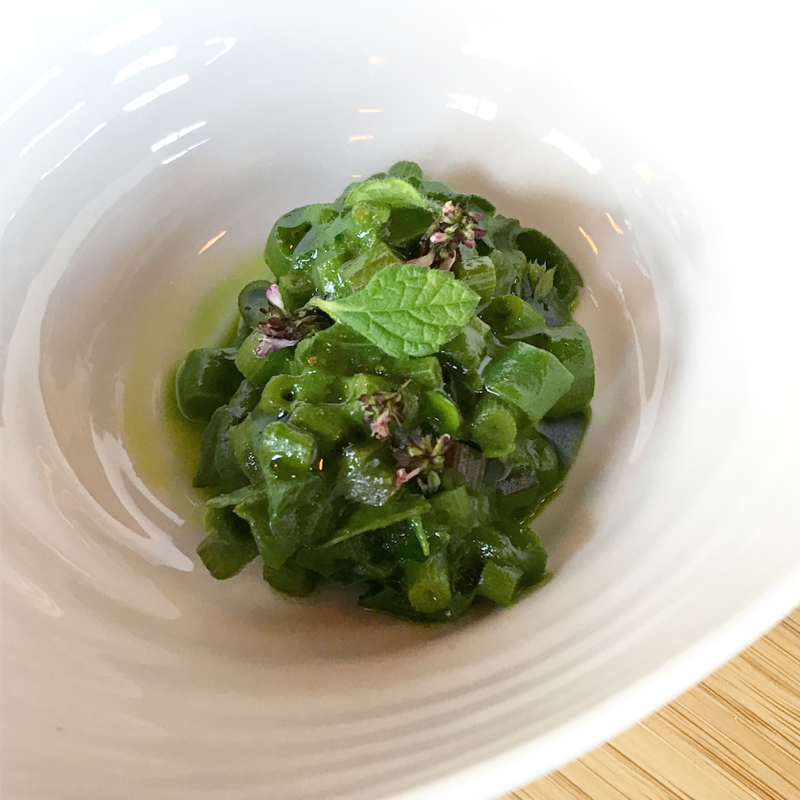 Chopped green beans and pickled beetroot stems were coated with a lovage and spinach sauce and there was a wild thyme garnish. With its bright green colours it looked pretty enough, but it was unpleasant to eat. Too many joyless, raw flavours and the lovage-spinach sauce was overwhelmingly strong. Thank goodness the meal continued with some warm and delicious pork bone broth and a thin slice of homemade Middlewhite pancetta. 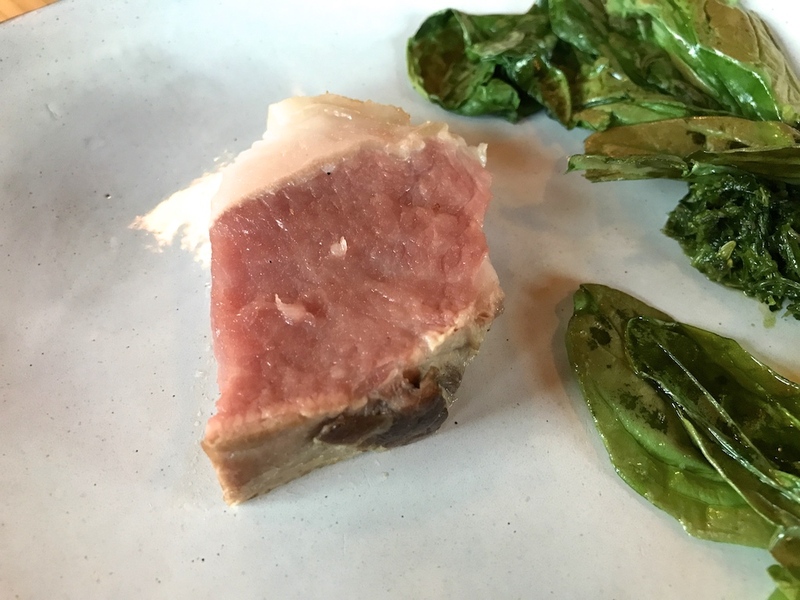 An enjoyable combination which made me look forward to the main course of Mangalitza pork. Little did I know. 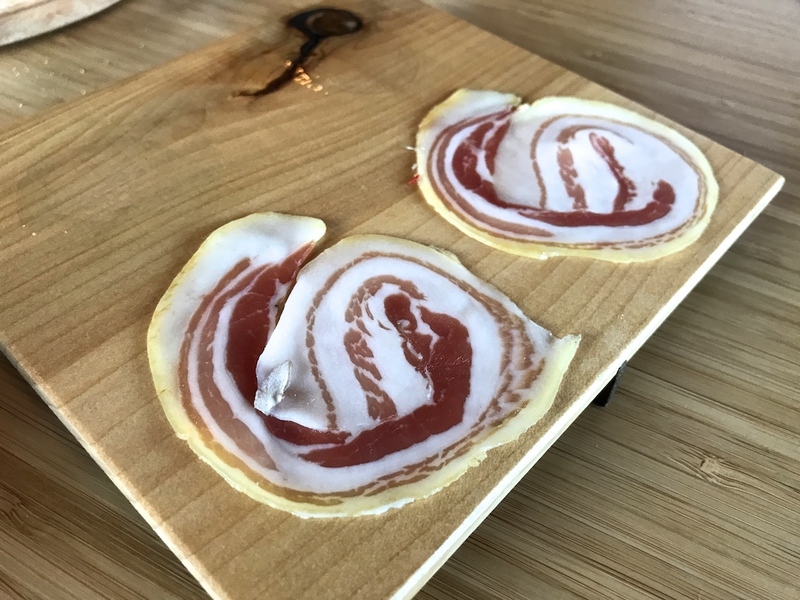 Mangalitza, the curly and wooly one that looks like a cross between a sheep and a pig, is one of the most prized pig breeds around, and its superior white fat is perhaps the best fat in the world. What could possible go wrong? 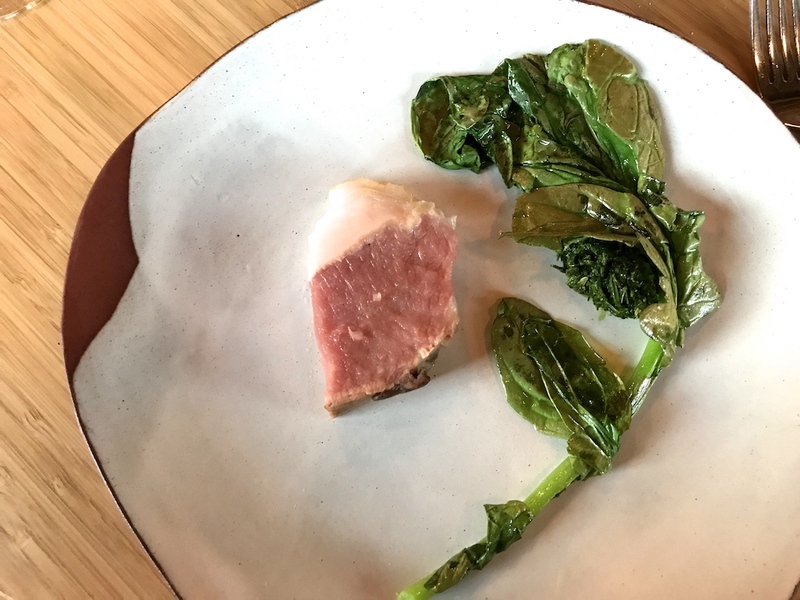 Well, you can lightly steam it and serve it practically raw and intentionally unseasoned, which results in totally bland meat, with chewy, unrendered fat and little tendons. Two mouthfuls was enough. I know raw pork is considered a delicacy by some, a concept that is lost on me. This beautiful pig named Rosa (so I was told) died in vain. Three sweet courses concluded the meal. First up were confit peach skins nicely paired with a peach kernel-flavoured whipped cream. 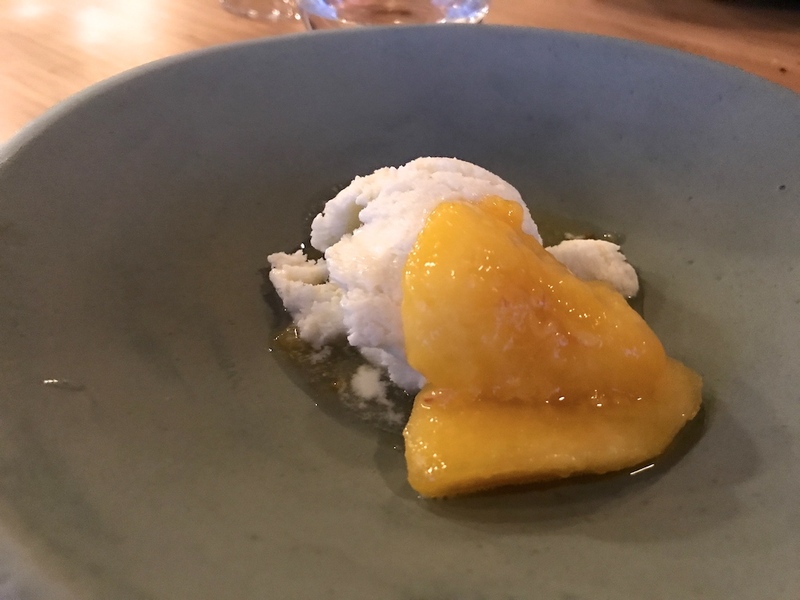 Second dessert was fermented peach (fermented for one week in sugar and vinegar) served with yoghurt ice. The yoghurt ice lacked creaminess and the peach wasn't very good either, with unattractive yeasty notes. A natural, unfermented peach would have been a better choice. 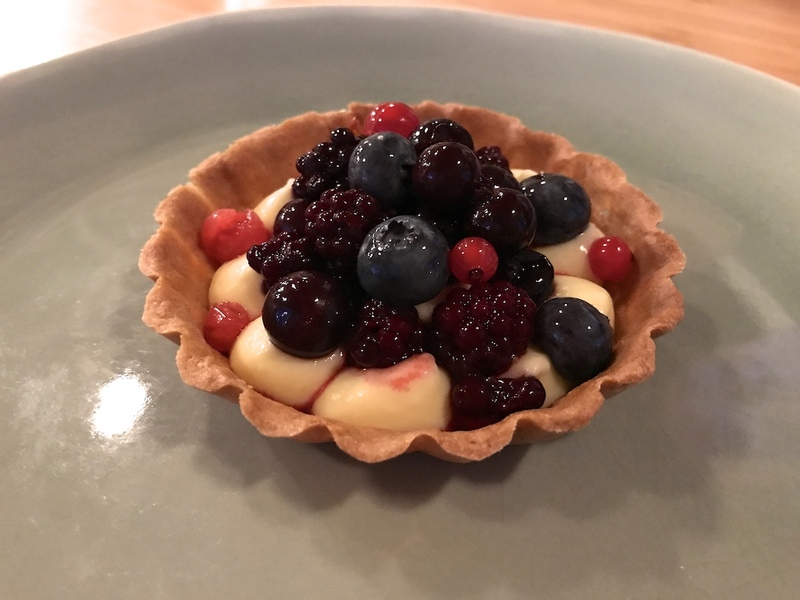 Finally there was a pretty little fruit tart with pastry cream and (fermented) summer fruits. Nice enough, but I wasn't convinced that the fermenting actually added anything to the fruits, apart from an unwanted acetic note. My meal at at WTLGI was an odd experience. 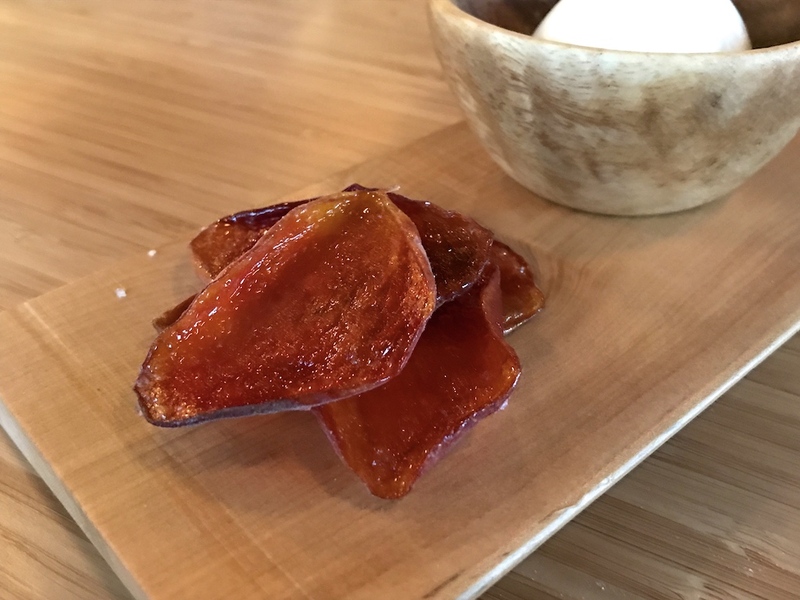 The restaurant puts al lot time and effort into sourcing local and seasonal ingredients, including (according to their Instagram account) breaking down a whole pig to ensure that "not a single scrap is wasted". Yet, having to sit through tonight's menu did leave me with the question: has anybody in the kitchen actually sat down and eaten this food? I'm all for fermenting and preserving, but only if it adds something to the ingredients. Here I got the feeling that they were fermenting for the sake of fermenting. There were a few ok dishes at the beginning of the meal, but things went downhill after the langoustine, the pork being a baffling low point. Sadly I couldn't drown my disappointment with wine, because the natural wine pairing was downright grim. I won't bore you with the details. The restaurant's website mentions "each night we endeavour to tell a story through a selection of plates". Sorry guys, but I didn't get your story. The friendly service and the great soundtrack were the only glimmers of light tonight.